As more people cannot afford to buy a new vehicle, more folks are turning to the used car market as an affordable solution. The problem in this is that there are only a limited number of used cars in the marketplace and it’s driving the price of used car up nearly 30% above the low hit in December 2008 shortly after the market crash. All those notorious Lemon cars are getting to be in short supply and short supply is attracting the attention of those loyal customers who originally bought them. 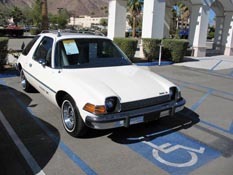 As an example, a 1975 AMC Pacer had an MSRP of $3,299 and now they are selling at Auction for double that, $6,825. So think about that the next time you’re driving next to a fully restored Gremlin.